Becoming a member of the Forum of Private Business you will become part of a not for profit national business organisation and we are constantly re-investing our profits into improving our products and services that we give to our members. At the Forum we know how important it is to support start-up businesses in the early part of their operation, as over 90% fail in the first 3 years of trading. We believe it is critical to have the right support, advice and protection in place and that means to be more than just the average one size fits all business advice that is currently available. Most business owners find that after a few months of trading, they start to come up against issues they don't know about and need help to overcome them, but where do they go? 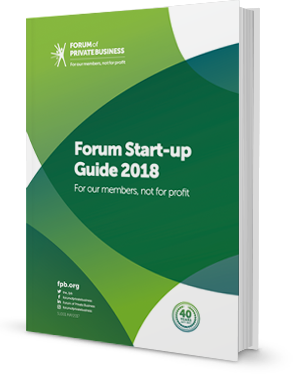 The Forum Start-Up guide gives a business start up an introduction to where you need to start, what you need to be doing to be compliant, along with the running of the business. Would you know how to register your business, how to set up your business and knowing if you need to be a sole trader or a Limited Partnership, to pay yourself and trading and more. The Forum Start-up Guide is all you will need. This guide is a digital-only publication and forms part of the Forum Start-up Membership. The guide is reviewed and updated as legislation changes and to enable us to keep the guide up to date we work with our legal partner and ACRA accredited Company Registrations Online. Whilst every possible care is taken to be as comprehensive and up to date with current legislation, we give step by step processes to ensure that you can form your business start up with the right information, to make it a successful and profitable. More than 35 customisable templates including data protection policy, health and safety policy, SWOT analysis and marketing planning templates. Forum helpline access for your questions, plus the extra reassurance of our partners, who can provide additional support and guidance.